This fictitious tale by Bridget Collins mesmerizes from the start… and I *hated* every moment when I couldn’t get back to it, even as the rest of life called. It is a tale of two characters whose lives intersect even though they come from different worlds, even when others conspire to keep them apart. It is heart-wrenching and sweet, and surprising. The depth and richness of each of the characters add to this magnificent story of redemption and the inevitability of destiny. As writers, we write what we are capable of feeling – every sorrow, every gladness, fear and doubt. What if what we write is in fact another’s true story? What if they are stories given to us because they are unwanted and discarded? What if we are in fact binding negative feelings – grief, fear, shame – others choose to forget into a book which we are then entrusted to protect and keep safe? What if unscrupulous binders betray this trust and make it available to others’ reading pleasure or worse? If you could tell and forsake your deepest and darkest secrets and feelings, so you can forever forget them, would you? What if you could tell your story, have it bound within a book and never look at it again… thereby relinquishing them forever, would you? What if you are the binder destined to keep these memories safe? What if the binding is used to serve the powerful and less than noble? Isn’t it better to remember your whole life? Or only your “good” life? This is the premise upon which this tale is told. And it allows us to imagine the magic of books and their binding. A resounding yes. 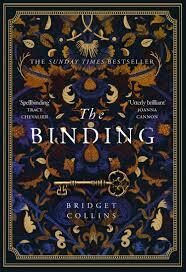 Well-paced and a relatively easy read, “The Binding” kept me turning pages wanting more. Most importantly, “The Binding” reminds us of the simplicity and that certain innocence of love even in the most difficult of times.